Deforestation of the Amazon is about to reach a threshold beyond which the region's tropical rainforest may undergo irreversible changes that transform the landscape into degraded savanna with sparse, shrubby plant cover and low biodiversity. This warning derives from an editorial published in the journal Science Advances co-authored by Thomas Lovejoy, a professor at George Mason University in the United States, and Carlos Nobre, chair of Brazil's National Institute of Science & Technology (INCT) for Climate Change. "The Amazon system is close to a tipping point," Lovejoy said. According to the authors, since the 1970s, when studies conducted by Professor Eneas Salati demonstrated that the Amazon generates approximately half of its own rainfall, the question has been raised of how much deforestation would be required to degrade the region's hydrological cycle to the point at which it would be unable to support rainforest ecosystems. The first models developed to answer this question showed that the tipping point would be reached if approximately 40 percent of the region were deforested. In this case, central, southern and eastern Amazonia would experience diminished rainfall and a lengthier dry season. Moreover, the vegetation in the southern and eastern parts of the region would become similar to savanna. In recent decades, new factors in addition to deforestation have affected the hydrological cycle. These factors include climate change and indiscriminate use of fire by agriculturists during the dry season to eliminate felled trees and clear areas for crops or pasture. 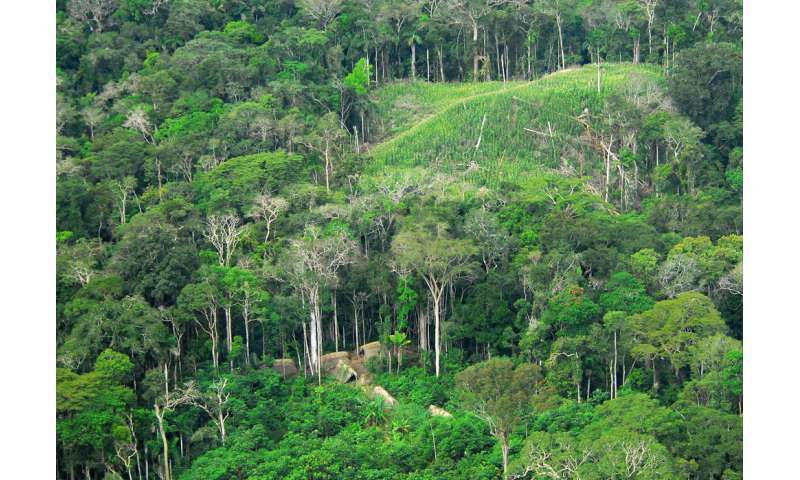 The combination of these three factors indicates a shift to non-forest ecosystems in the eastern, southern and central portions of the Amazon region at between 20 percent and 25 percent deforestation, according to the authors. The calculation derives from a study published in 2016 in Proceedings of the National Academy of Sciences and conducted by Nobre and other researchers at the INPE, the National Space Research Institute (from which Nobre is a retired researcher), the Natural Disaster Surveillance & Early Warning Center (CEMADEN) and the University of Brasília (UnB). "Although we don't know the exact tipping point, we estimate that the Amazon is very close to this irreversible limit," Nobre said. "Deforestation of the Amazon has already reached 20 percent, equivalent to 1 million square kilometers, although 15 percent [150,000 km²] is recovering." According to the researchers, the mega-droughts of 2005, 2010 and 2015-16 could well represent the first signs that this tipping point is about to be reached. These events, together with major floods in 2009, 2012 and 2014, suggest the entire Amazon system is oscillating. "Human action intensifies the disturbances to the region's hydrological cycle," Nobre said. To keep the Amazon tipping point at bay, the researchers advocate not just strict control to prevent further deforestation but also the construction of a safety margin by reducing the deforested area to less than 20 percent. For the coordinator of the FAPESP-funded institute, besides halting deforestation completely in the Amazon, Brazil must fulfill its 2015 Paris Accord undertaking to reforest 12 million hectares nationwide by 2030, with the Amazon accounting for 5 million hectares. "If deforestation is brought to a full stop in the Amazon and Brazil fulfills its reforestation commitment, totally deforested areas will account for approximately 16 percent-17 percent of the Amazon by 2030," Nobre said.